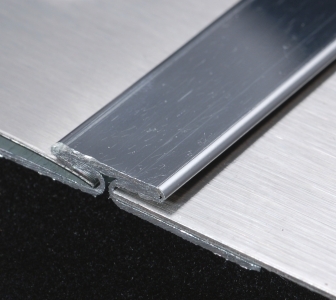 Stainless T Channel Trim moulding gives a professional smooth finished look when connecting two sheets together during installation of our stainless or aluminum sheets on walls for back splashes, paneling or wainscoting. Made from corrosion resistant 24GA 430 stainless steel with a bright annealed finish, they are available in 4ft, 8ft and 12ft lengths and are easily cut on the spot for simple installation. For use with sheets up to 16ga (.063") thick.